Karaoke is the Japanese word for “empty orchestra”, but you probably know it better as an activity that almost every bar holds where drunken people come up and badly sing along to old music. This might sound mortifying to you, but once you get a few drinks in your system you’ll change your mind and get up there. It doesn’t matter how well you sing; what matters is enjoying yourself. Not to mention, if you’re looking to get laid then this will certainly at least get you noticed. The best part about karaoke is that it doesn’t have to be something you do alone; hell, it doesn’t even have to be something you do with your friends. Grab a beautiful woman near you and drag her up there to sing a duet – the more hilariously romantic the better. You’ll be sure to get her laughing, and she’ll be falling all over you trying not to crack up in the middle of the song. If you really want to make it even funnier and aren’t actually trying to show off, go ahead and switch the roles in the song. She won’t be able to compose herself at all if you start singing the woman’s part in a high falsetto, and she’ll be sure to stay with you for the rest of the night because you have such a good sense of humor. Even if you’re typically introverted, getting up there and doing some karaoke in front of everyone is a good way to get out of your shell and just have some fun. It’s thrilling to be up on stage with people watching you, and it’ll give you a rush when you’re done that will make you bolder and more attractive to women. If you do sing well, you’re sure to get plenty of women who want to talk to you once you’re done. If you sing poorly, then get up there and make the best of it – be ready to be laughed at and just go over the top. Your hilarious nature actually can do a lot to get you women. 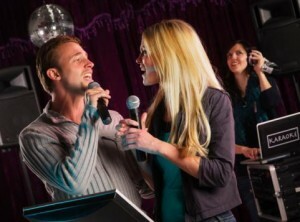 If you get up and do karaoke every weekend, people are going to start talking. You might just be known as “Karaoke Guy”, but hey, at least you’re well known. Women are much more likely to go after men who have at least some sort of notoriety, even if it’s just for your awful karaoke performances. This is exactly why you should be either really good or really dramatic – anything in between will cause you to fall through the cracks and not be noticed at all. Don’t let your new fame get to your head. A certain amount of ego is okay, but a ton is just off-putting to women, and you won’t get lucky at all. You might be well known at the bar, but having a bad attitude will come back to bite you, so just take the time to be nice and enjoy your karaoke fame.